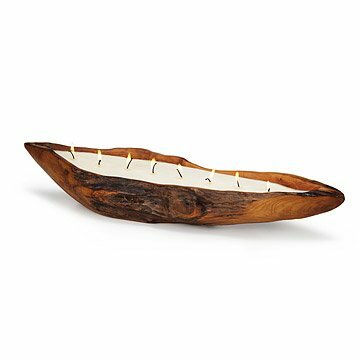 Balinese artists hand-carve teak wood into this rustic, boat-shaped candle. Dock this ship-shaped candle on your coffee table or nightstand to bring the woodworking talents of Balinese artists into the harbor of your home. Artisans hand-carve each titanic vessel out of teak wood. The rustic, sea-inspired design shows off the knots and unique internal patterning that distinguishes this hardy wood. The candle itself is made of a proprietary blend of sustainable beeswax and palm wax. The clean, slow-burning blend produces absolutely no soot, and smells only of its refreshing ginger lily essence. Once the wax burns down, the candleholder can hold a gathering of tea lights or votive candles of your choice, or can be used as a generously sized potpourri dish. Handmade in Bali. Wipe down with a damp cloth. Trim wicks down to 0.25". Never leave a burning candle unattended. Keep away from drafts, pets and children. Great looking, top present this year. Product looks great as a centerpiece or on the sofa table; smells good burns slowly. A definite hit! Gave this gift to my stepmother, and I did not read the description very well. I did not realize that the candle was scented - it is VERY smelly; it smells wonderful, but it gave me a bit of a surprise. The smell is like clean herbs. The candle is also enormous and a bit heavy. My stepmother recently had shoulder surgery and I ended up opening everything for her due to the weight and size. It is a bit big for most coffee tables - but it makes a great centerpiece at a dining room table. The wood is gorgeous and the piece I received had a nice big knot in the side that created some cool holes and twists. Overall, it was MUCH nicer that I had expected, and the gift was very well received. My stepmother is also excited for when the wax is finally used and she can use the wooden boat for other decor. Gave this to my wife for our anniversary and she immediately loved it! A great way to add ambient light and a wonderful scent.